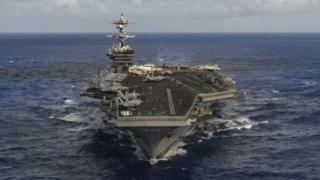 The US military has ordered a navy strike group to move towards the Korean peninsula, amid growing concerns about North Korea's missile programme. The Carl Vinson Strike Group comprises an aircraft carrier and other warships. US Pacific Command described the deployment - now heading towards the western Pacific - as a prudent measure to maintain readiness in the region. President Trump has said the US is prepared to act alone to deal with the nuclear threat from North Korea. "The number one threat in the region continues to be North Korea, due to its reckless, irresponsible and destabilising programme of missile tests and pursuit of a nuclear weapons capability," US Pacific Command spokesman Dave Benham said. The strike group comprises the Nimitz-class aircraft carrier USS Carl Vinson, two guided-missile destroyers and a guided-missile cruiser. As well as massive striking power, the carrier group - headed by Admiral Nora Tyson - has the capability to intercept ballistic missiles. It was originally due to make port calls in Australia but instead has been diverted from Singapore to the west Pacific - where it recently conducted exercises with the South Korean Navy. How advanced is North Korea's nuclear programme? North Korea has carried out several nuclear tests and experts predict more could be in the offing as it moves closer towards developing a nuclear warhead that could reach the US. There have been indications from North Korea that it may test an intercontinental missile, even though it is banned from any tests under UN resolutions (restrictions it has consistently ignored). On Wednesday, it test-fired a medium-range ballistic missile from its eastern port of Sinpo into the Sea of Japan. That test came a month after four ballistic missiles were fired towards the Sea of Japan, moves that provoked a furious reaction by Japan. On its part, North Korea says it is provoked by military exercises between the US and South Korea, which it sees as preparation for an invasion. North Korea has also been closely watching how US President Donald Trump has been responding in Syria. Early on Friday, the US military launched air strikes against the Syrian government, in retaliation for a reported chemical attack. North Korea called it an "intolerable act of aggression against a sovereign state", and said the strike showed it was justified in bolstering its own defences. Is South Korea equipped to defend itself? What can the outside world do about N Korea? What are the moves behind the scenes? The most recent test - condemned by Japan and South Korea - came on the eve of a visit by China's President Xi Jinping to the US to meet President Trump. The two leaders discussed how to rein in North Korea's nuclear and missile programmes as the US steps up the pressure on China, a historic ally of Pyongyang, to help reduce tension. China has, however, been reluctant to isolate its neighbour and ally, fearing its collapse could spawn a refugee crisis and bring the US military to its doorstep. China has long been North Korea's closest diplomatic ally and trading partner, but the relationship has become increasingly strained over Pyongyang's refusal to halt nuclear and missile testing. Mr Trump said in a recent interview that Washington was ready to act without Beijing's co-operation: "If China is not going to solve North Korea, we will." The US Treasury recently slapped sanctions on 11 North Korean business representatives and one company, while US politicians overwhelmingly backed a bill relisting the North as a state sponsor of terror. North Korea responded by warning that it will retaliate if the international community steps up sanctions, saying the US was forcing the situation "to the brink of war".